Toaday We(Me, Jitu and mukesh) went to IMAX, WADALA and watched The IMAX® space legacy: MAGNIFICENT DESOLATION: WALKING ON THE MOON 3D. ITl take audiences to the surface of the Moon to walk alongside the extraordinary Apollo astronauts who have stepped upon its surface. With never before seen photographs, CGI renditions of the lunar landscape and previously unreleased NASA footage, audiences will be immersed in the life-changing experiences of these astronauts by showcasing what they saw, heard, felt, thought and did while on the lunar surface. 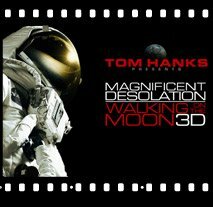 Produced by Tom Hanks and Gary Goetzman of Playtone and by IMAX Corporation, MAGNIFICENT DESOLATION: WALKING ON THE MOON 3D is directed by Mark Cowen, Emmy Award nominee for the documentary film "We Stand Alone Together: The Men Of Easy Company," and executive produced by Mark Herzog and Hugh Murray. The film's content is based on "The Lunar Surface Journals," a massive archival database compiled over the last decade by Dr. Eric Jones, which chronicles the moon walks as recounted by the astronauts. If anyone intrested to know the actual facts , how NASA fooled people in 60's when the video camera, TV are in its infancy and showing pictures of moon landing 45 years back is hard to belive. For the last 5 years NASA didnt able to carry out a safest "SAPCE WALK" i mean Space trip , even with many folds advansment of space research . Hi saum! How are you? You are doing great. Each and every word of yours is full of fun. Dude - I really miss you. Sure will come to JDM and lets have a fun there.